We believe that every patient should be given the very best chance to recover and to stay that way. 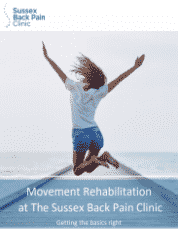 Restoring Proper Movement is often the missing link to your full recovery. Some kind of exercise is essential in order to fully recover from your pain. Indeed, Exercise is recommended by the latest (2016) NICE guidelines for best practice, to be used alongside osteopathy for spinal pain. Your osteopath will advise you on this, which may be as simple as just being a bit more active. With things like walking a bit more, getting out of a chair unaided or doing a few basic exercises your mobility and muscle strength is restored, allowing you to get on with your life again. Our unique movement rehabilitation programme can help. Your body is constantly adapting to what you are doing now and what has happened in the past, sometimes it gets into bad habits that affect your ability to move correctly. These, if persistent, become learnt and therefore become ‘normalised’. These unhealthy adaptations have the ability to place abnormal strains, on a day-to-day basis, on your joints and muscles which become painful and never fully recover as expected as long as this ‘compensation’ exists. If your problem persists with treatment, doesn’t ever get totally better, or flairs up from time to time, a movement control problem could be the cause. By using screening systems, we make sure that you can do the basics, firstly without pain and then well enough before increasing your activity levels. With consistent monitoring and the most up to date methods, we progressively re-educate your nervous system to move properly before allowing you to advance your activity level to where you want it to be. By using the same process as you did when learning how to move as a child we can help you restore healthy, easy pain free movement again. During the first two years of life we develop the basics of movement – to roll over, sit, crawl, squat and walk. All of these fundamental movement patterns emerge without any instruction whatsoever. Our development is driven by constantly challenging the nervous system and neuroscience has shown that as we grow we develop movement like a language. We progressively learn by constructing the basic building blocks and developing them for more complex movements. This requires progressively highly complex, learnt communication and coordination (motor control) between the brain, nervous system and the muscles and joints. This “sensorimotor” system allows us to move effortlessly and automatically without any conscious thought. Just like children do! Strangely, most rehabilitation approaches show little or no regard for the nervous system or how we develop our movement in the first place. This should always form the foundation of the rehabilitation pyramid. Rehabilitation traditionally focuses on individual muscles, measuring flexibility and strength (Performance), with the aim of stretching tight muscles and strengthening weak muscles to establish good individual joint strength and mobility. However, this is not how your brain works or how we learnt to move as infants and will not change faulty movement. Often strength and fitness are built upon these faulty patterns that have neither been identified nor corrected creating a ‘top heavy’ pyramid. This often leads to postural changes, abnormal loading, inappropriate healing, poor efficiency and recurrence of pain or injury. But WE do things differently. Once improvement is noted in the abnormal pattern we repeat the screen to identify the next priority and correct this until you have achieved your goals. By resetting the most basic pattern it is possible to see other patterns change without specifically working on them. 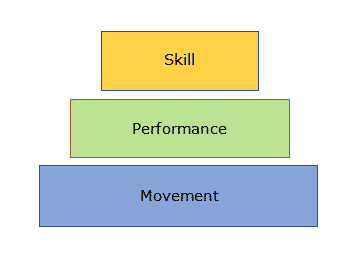 This corrects and enhances your movement control so creating a strong foundation to your rehabilitation pyramid enabling you to safely return to higher levels of activity. This can usually be done within 4-6 weeks but does depend on your individual circumstances. 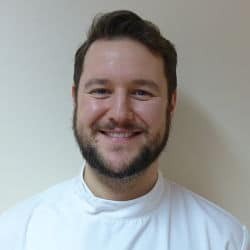 As we focus on developmental movement patterns and motor control, incorporating the latest neuro science, our specialist movement coaches can identify the most basic faults in your movement patterns and can use corrective exercises to re-educate the nervous system to correct these and establish better motor control. This eliminates abnormal stress on muscles, joints, discs, nerves and connective tissue, improving efficiency and allowing proper healing. We eliminate the weak links to create the solid foundations needed to work at higher levels safely and efficiently, ensuring that you move well and keep moving well to enjoy pain-free and efficient movement whatever your age or ability.